Shopping as a cultural activity? In Mexico, especially in DF, it’s very possible. Just as there’s food on every corner of the city, there are items to buy, customs to learn, and captivating vendors with whom to converse. Shopping in Mexico is much more than just buying—it’s learning about the item’s origin, method of production, variety of uses, and names. These markets, bazaars, and other locations are open all year long, but during December the pace quickens. Restaurants cater busily to large tables of celebrants. Traffic for the first three weeks of the month swells, the streets packed with honking cars, motorcycles, and bicycles. Things calm down around the 23rd when everyone is celebrating Christmas at home or has headed for the Pacific or Gulf coasts to bask in the sun. You can bargain in the street markets and tianguis, but don’t be surprised if the vendors don’t want to drop their prices. In the bazaars, you may get a deal if you’re a regular client, you purchase several of the same item, or if your total purchase is significant and the vendor wants to show appreciation. Enjoy the city as you shop. Paseo de Reforma, the main artery, is lined with bright-red poinsettias (known in Spanish as noche buenas). Half of the zócalo is converted into an ice rink, leaving the other half dedicated to snowman-making, toboggans, and other children’s activities. All of DF is adorned in joy. Not only do bazaars offer a cornucopia of unique items, the quality of the workmanship is high, the artists are quirky, creative, and chatty, and the ambiance is enchanting. Bazaar Sábado: Located in Colonia San Ángel, Plaza Jacinto. Metrobus stop La Bombilla. As the name indicates, the bazaar is open only on Saturdays from 10 am to 7 pm. Two years ago (December 2011), The Eye dedicated an entire article to this bustling marketplace. It’s famous in the city and a must-see, whether you’re a shopper or not. Many browsers are there simply to view the excellent workmanship of items ranging from shoes, clothing, and jewelry to ceramics, huipiles, and enamel work. Everything in the bazaar is created by artists who sell their creations on Saturday. The vendors areas, located on two stories, surround a garden restaurant (mostly enclosed). Outside the Bazaar, en Plaza Jacinto, easel artists display their paintings, and just steps away some of the best quesadillas in the city are being grilled. Another antique building chock-full of artisans, this bazaar is open 7 days a week from 11 am to 7 pm. Because the artists are eager to describe their methods and techniques, visits to these bazaars are as much a social event as a shopping chore. You’ll meet people from all over the world and make new friends. Stop and have a coffee and piece of delicious cake made by the Café Ruta de la Seda, an eco bakery. This annual bazaar takes place once a year, on the first Saturday of December. Not only will you find unique handmade items here (clothes, jewelry, children’s items), but also a variety of homemade food items (jams, jellies, pickled chiles, and baked goods). One room is totally dedicated to a fine selection of used books in good condition at dead-cheap prices. 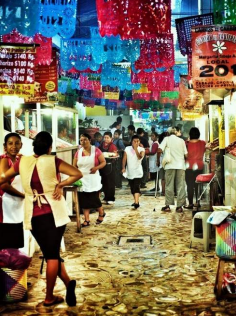 Tianguis is an Aztec word for open-air markets that take place on certain days of the week. In Mexico City, they permeate the city. You’ll find them in every colonia–just ask the locals to point the way. Here you’ll find a diverse selection of items including clothing, shoes (new and used), household goods, plants, DVDs, CDs, batteries, stationery items, bedding, kitchen utensils, and anything else you can imagine. Other markets, too, have permanent locations. Note that all markets have food galore, but if you’re a tourist lacking Mexican flora in your intestines, view these foods like you would eating on the street…and leave them alone. A little-known surprise for tourists that most guide books don’t offer: culture and shopping in the metro stations, both above and below. The biggest metro market is underground at the Zocálo Metro stop, where shopping runs for an entire block between the two entrances. Here you’ll find books at good prices, stationery items such as agendas and calendars, and a variety of other goods. You can even find an internet kiosk there. Several metro stations also boast cultural and historic displays. There’s a pyramid in the Piño Suarez station, 48 murals in various other stations, and more than 100 reproductions of fiberglass in the Bellas Artes and Panteones stops. These are just some of the pieces that make this subterranean space the biggest, cheapest, and most diverse museum in Latin America. We’d be remiss if we failed to mention the vast number of department and specialty stores in DF. The priciest are Palacio de Hierro, Liverpool, Sanborn’s, and Zara, and for some items the quality is high but for others not. In Zara Home you can find beautiful items for your bath and kitchen at fair prices. Look on the sale rack for some excellent bargains. There are two favorite specialty stores with branches throughout the city: Gandhi Bookstores and Mixup (for DVDs and CDs). If you can’t find the ideal gift, a gift certificate to either store is the perfect solution for friends of all ages. Keep in mind food items as gifts as well. Superama and City Market have delightful selections, including special oils, jams, mustards, and organic food items.